Office Space - Congleton, Cheshire. This work space offers high-quality serviced office suites in a stunning period building. 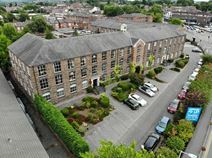 Located in central Congleton, the office space is in close proximity to many shops and lunch spots. The business centre offers many great facilities, such as; meeting rooms, conference facilities, kitchen on every floor and on-site parking. There are many office suites available, ranging in size from 175 Sq Ft to 2,500 Sq-Ft.